Restoring your vehicle means getting it back on the road as quickly as possible, in its pre-accident condition. So, wherever you are in Fairfield and New Haven Counties Breezy Point has you covered. 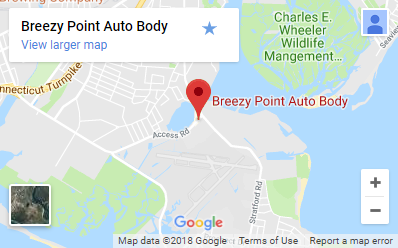 Breezy Point provides full-service collision repair on all makes and models. From the framework, mechanical and electrical all the way to the body and refinishing. You should not have to call us for updates or questions on what is being done. It is our responsibility to keep you informed from start to finish, to explain what needs to be done so it is easy to understand and get it done in a very reasonable time frame and delivered back to you ready to roll and all vehicle manufacturers required procedures completed. Our goal is to have you be completely satisfied and thrilled to recommend us. We have the right stuff and more importantly the best people to deliver this. We look forward to you giving us the chance to stand and deliver! Don’t stress, Breezy Point will even handle your insurance claim from A to Z. From calling in your claim to arranging final payment, we make the whole process effortless. We know that an accident isn’t an ideal way to experience our shop but we strive to make the experience of repairing your vehicle as positive as we can. Our staff is committed to you and makes every effort to make the experience smooth and painless. Our estimators and customer service representatives are here to help you every step of the way by providing you the knowledge and professionalism you deserve. Check out our testimonials! At Breezy Point our confidence in our work gives us the ability to offer our customers a lifetime warranty on all our repairs, what’s better than that? Our repair process isn’t the only thing that’ll get you back on the road faster. Our partnership with Enterprise Rent-a-Car saves our customers both time and money, often with an on-site location. We even have discounted rates that we can pass along to you if your insurance policy does not cover a rental car. Need a ride? One of our friendly staff members will drive you home or to work when you drop your vehicle off for repairs and will pick you up when your vehicle has been completed. We employ highly skilled and friendly body shop customer service staff and technicians. All of our technicians abide by certifications and educational standards set by the collision industry. This translates to our customers having the best resources we can offer in the unfortunate circumstance of going through an auto accident. Through I-CAR and vehicle manufacturer training we are serious about fixing your car to the high standards you expect. Breezy Point is equipped with state of the art equipment and resources. While wrenches and screwdrivers still have their place, today’s vehicles require far more complex diagnostic and repair equipment. The advanced tools and service information our technicians have access to allow us to quickly and accurately diagnose and repair your vehicle. We continually invest in computerized repair and refinishing systems to ensure quality repairs on today’s vehicles. At Breezy Point we ask our customers to complete a qualified third party to survey regarding every aspect of their repair experience. With our satisfaction at nearly 100%, you can rest assured you are in good hands! Breezy Point Auto Body has been exceeding the expectations of automobile owners since 1989. We’re a family-owned business that delivers superior customer service and attention to detail that large chain collision repair centers simply can’t match. As a high-volume repair shop with a state-of-the-art facility, we have the advanced technology and capacity to handle even the most difficult of auto body repairs. At Breezy Point, we take pride in staying ahead of the curve, learning the newest techniques and implementing best practices when it comes to each and every customer. So, when you hand your keys to us, you’re taking the first step toward restoring your vehicle to its pre-collision quality- it’s what drives us. Breezy Point Auto Body makes collision repairs a breeze!